If you are interested in a bathroom remodel, then there is likely a very good reason. Perhaps the old design is outdated, maybe you want to make it more energy efficient, or maybe you are just ready for a change. Regardless of the scale of your bathroom remodel, Pacific Green Homes can help you every step of the way. We have designers that can help you with new remodelling ideas, and installers who can bring those ideas to life, quickly and efficiently. If you need any bathroom remodel ideas, then keep reading for ideas that will give your outdated bathroom a facelift. No matter your budget, you should think about the following factors when considering new design ideas. Easy to Clean Counters – Materials like quartz or laminate look great, are highly durable, and are stain-resistant and non-porous. Larger Floor Tiles – Grout gets dirty quickly and is very hard to clean, so the less of it there is, the easier it is to clean. Large tiles use less grout so they are not only easier to clean, they are easier to seal from mold and stain build-up. This means that they need to be cleaned less frequently. Use an Open Design Plan – Design ideas like floating vanities, walk-in showers, and freestanding baths make cleaning easier. That is because there are fewer nooks and crannies for dust and grime to accumulate. Low-Flow Toilets – Most new toilets are of the low-flow variety, with a dual-flush function. However, if you need even more functionality, then you can purchase a flush converter that allows you to alter how much water you use for each flush. This option can save a lot of water—and a lot of money—over time. High Efficiency Shower Heads – Efficient shower heads have a poor reputation for low-pressure and weak water flow. Those are not problems for modern energy efficient shower heads; they solve that problem by producing a high pressure flow that is indistinguishable from traditional shower heads. Faucet Aerator – This is less a design idea and more of a design augmentation. A faucet aerator is attached to the faucet to make it conserve water better. It also reduces splashing and faucet noise without reducing water pressure. Since an aerator can be attached to any faucet, it will not limit your design options. LED Lighting – LED lights are far more energy efficient than the traditional incandescent bulbs typically used in bathroom vanities. Switching to LED bulbs will drastically reduce the utility bills without drastically reducing the amount of light produced. They also last far longer than incandescents so you will be replacing them less frequently, which also saves you money. Use Layers of Light – A variety of different light sources give warmth and depth to the bathroom. You have task lighting which is used when applying/removing makeup, shaving, and so on. However, you can add accent lighting in various parts of the room via pendant lights or wall sconces. Windows and Skylights – If your home and budget allow for it, the addition of skylights can allow a lot of warm natural light to flow into the bathroom. Large, clear windows also help, and you can add colorful, stylish shades to cover them when you need privacy. Bright, Reflective Surfaces – If you plan to improve the lighting of the bathroom, then a reflective surface can enhance the lighting even further. This helps to make the room look larger and allows you to use less lighting, which helps to save on utility bills. Ultimately, the most important aspect of your bathroom remodel is what you want. However, following these bathroom remodel guidelines does not mean that you have to sacrifice any of your design ideas for the sake of pragmatism. There are a variety of options available to you even if you want a low maintenance, energy efficient, and well lit bathroom. 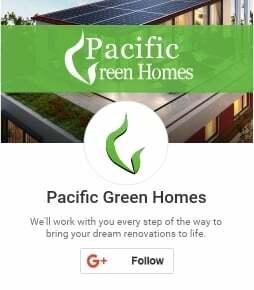 Contact Pacific Green Homes and we will help to narrow down those options while making sure that you get exactly what you want.